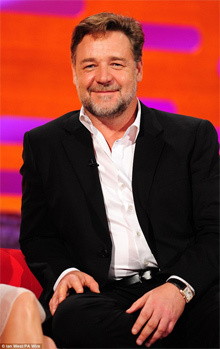 He’s the star of Hollywood blockbuster, Noah, but Russell Crowe, 49, told Graham Norton that when it comes to his family, he’s just a normal down-to-earth guy. The actor was interviewed on popular talk show alongside Kylie Minogue and Cameron Diaz, where he revealed that press coverage puts him off from having relationships in the public eye. Russell, who split from his wife of nine years, Danielle Spencer, in 2012, with whom he has two sons, Tennyson, 7, and Charles, 10, says that he thinks of family first. Russell also touched upon the subject of his latest movie, the controversial Noah, in which he plays the lead role, alongside Emma Watson, Jennifer Connelly and Douglas Booth. He told Graham: ‘A lot of it was people who took it upon themselves to have an opinion without seeing the movie. 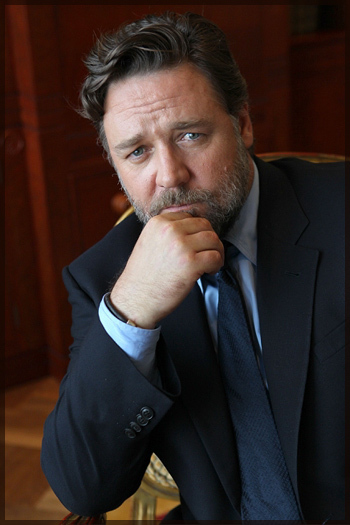 Norton also asked Russell if he intimidates directors and he replied: ‘Yes. The thing is, I’ve worked in front of a camera since I was six years old and I’ve done 25 years of lead roles in feature films. Russell recently told the Kyle and Jackie O breakfast show that his sons were overwhelmed that their dad worked with Emma Watson in the movie as they are huge fans of hers. This entry was posted on Saturday, April 5th, 2014 at 17:21 and is filed under News, Personal Life. You can follow any responses to this entry through the RSS 2.0 feed. You can leave a response, or trackback from your own site.